The United Kingdom has been undergoing radical changes recently, and these changes have the potential to affect existing laws on marijuana use and related activities. However, as the rest of the world looks at the UK for any other drastic move after Brexit, the atmosphere surrounding its cannabis culture remains relatively calm. Here are some things you need to keep in mind if you plan to buy cannabis seeds in the UK, smoke pot, or engage in any other related activity. Weed has been illegal in the UK since 1923 when cannabis was officially listed as an illegal substance under the Dangerous Drugs Act of 1920. At present, marijuana is classified as a Class B drug under the Misuse of Drugs Act, which was passed in 1971 and considerably raised penalties. As a Class B substance, cannabis is placed on the same level as amphetamines and ranked below such drugs as LSD. Growing and selling weed can land you in jail for up to 14 years and fined an unlimited amount. For possession, the jail time can be as long as five years and the fine is also unlimited. If you are at least 18 years old and caught selling, using, growing, or possessing marijuana, the authorities can seize your cash and property. However, if it is your first offense, the cops will let you go with a warning, which does not show up on your criminal record or national police database and hence does not affect your employment prospects. If it is your second offense, you may be issued what is called a Penalty Notice of Disorder and an order to pay an 80-pound fine due in 14 days. Missing this payment warrants a court appearance. Finally, if it is your third (or more) offense, an arrest is inevitable and you may be sentenced and end up with a criminal record. Nosy neighbors and backstabbing friends are not the only ones you need to watch out for. In the UK, the government requires financial institutions to report clients who are showing suspicious account activity that may indicate drug dealing. You can only grow marijuana in the UK if you have a valid license from the Home Office. To obtain such a license, you have to meet certain guidelines, including but not limited to a criminal record check and a fee of around 580 pounds. Medical marijuana patients in the UK can legally secure and consume their supply, but the current system is highly problematic mainly because of the limited supply and variety and the prohibitive costs. There is currently a cannabis-derived medication available in the UK. This substance is commonly used by patients with multiple sclerosis and administered by spraying under the tongue. Unfortunately, this drug is scarce mainly because it was declared substandard by the National Institute for Health and Care Excellence and its manufacturer charges such a high price for it. In fact, counterparts of the said drug can be bought in other countries for a fraction of its price in the UK. According to industry experts, the price difference is due to the bureaucracy that the manufacturer goes through to sell the said spray in the UK. There are such a long procedure and plenty of hefty fees involved, and these are passed on to the patients. In addition, the costs of research and development, production, logistics, marketing, and the like have to be considered as well. The limited supply is caused by legislation. Currently, it is the only marijuana-based medication allowed in the UK and in fact only allowed for use by multiple sclerosis patients despite that sufferer of other disorders have reported experiencing relief from the drug too. Currently, a petition to downgrade marijuana to Class C categorization is still pending. This proposal was initiated in 1979 by the Advisory Council on the Misuse of Drugs and is still being lobbied by supporters today. Aside from this issue, Brexit-related matters are being discussed by supporters and detractors of cannabis alike. Shortly after the controversial vote was announced, rumors spread among Brits that non-EU citizens could be prohibited from buying marijuana seeds in the UK. This hearsay might have been inspired by the so-called “weed pass” in the Netherlands, a policy (still in place but now largely ignored) prohibiting non-Dutch people from smoking weed in their ubiquitous coffee shops. EU laws provided protection against such policies, and many British citizens feared that leaving the EU meant losing this protection and instead of being subjected to the laws made by their own government, which is still not showing any sign of wanting to legalize weed. However, these rumors have so far not been substantiated. 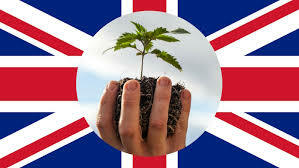 At present, the UK permits the possession and purchase of cannabis seeds regardless of type and cannabinoid content. When in the UK, you are free to buy marijuana seeds online or from trusted individuals. Of course, there is a black market for weed, which is only being fortified by existing laws, sanctions, and problematic implementation. Currently, the use, sale, purchase, possession, and cultivation of marijuana for recreational purposes are illegal in the UK. The only positive news related to this is that the authorities clearly are not pursuing a marijuana-related criminal activity as a top priority. Offenders are often given sentences that are lighter than expected. Meanwhile, medical cannabis is permitted, but supply is monopolized, limited, and utterly expensive. Although the present state of cannabis in the UK looks bleak, supporters continue to lobby for reform and users and growers continue to source cannabis seeds through trusted channels and from reliable companies.